Value Village / Savers 50% off sale in USA: Monday, November 11th, 2013. 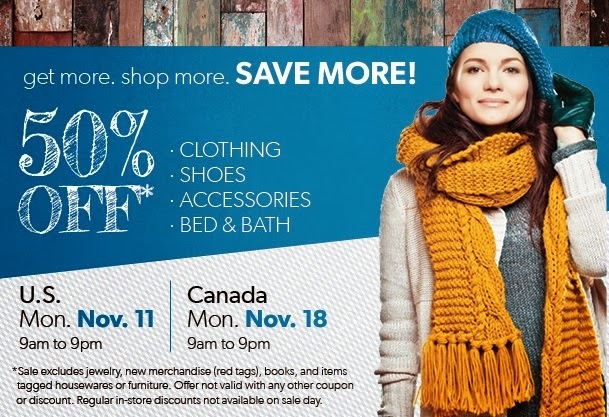 Value Village 50% off sale in Canada: Monday, November 18th, 2013. I used to live 2 blocks from a Goodwill many years ago & for years Goodwill had a 50% off sale every Friday as well as the last day of every month. They've cancelled those at the Goodwills I visit (& that Goodwill has since closed) & last I knew, they have specific days with specific departments that are 50% off. I used to be a loyal 50% off day shopper, however now, I won't go within 1,000 feet of one unless by accident. I have seen fights, people moving full shelving units full of dishes to retrieve stuff they've hidden, personal notes written by staff to a customer who hides stuff Thursday nights to get it Friday mornings, the buggy theft (I'm sure we've all witnessed those) & I've waited in a line 45 people deep (over half an hour) to pay for a magazine from 1992 with Courtney Love on the cover. I hear at some particular stores some people line up 1+ hour on sale days, although, this is a store where 50% off days include everything in the store. Personally, I find so little on a regular day at any given thrift store, how the hell am I going to find something on a day when everyone, their mother, their grandmother & their great grandmother is there? Not going to get up at 6am to get there for doors open, not going to wait in half an hour line behind a woman buying 20 pieces of clothing that have half the tags ripped off them because she thought they were too expensive (even on 50% off day!) & I don't mind paying full price the night before if I don't have to deal with the crowds! I can barely deal with 2 minutes in Union Station during rush hour, I can't deal with 80 frantic people in one little store all worried everybody else is getting the good stuff! Maybe I just lack patience? One store has 50% off colour tags, but usually don't find anything worthy of making it home... wish more stores did this! (*ahem* Value Village). Anyways, sales at VV usually have little warning (this one came with much notice!) & I usually have to flip flop my thrifting schedule, but it's. cool, I guess. That's my two cents. Maybe you and your BF should move to the states just for the better thrifting, estate sales, and instant mashed potato selection! LOL! He totally wants too, I think. His family is from the USA. I don't want to. I prefer to go the day/afternoon before sale day, when the shelves are pretty much stocked for the next day chaos, yet the crazy people aren't there yet. I don't mind regular price at thrift stores. And too funny--you waited in line over half an hour for a 1992 magazine featuring Courtney Love? The things we do . . . .
Our thrift stores do a 50% off color tag that they change out weekly. I've never experienced chaos like that at a thrift store. Now estates sales.....they are like that all the time! That's why I'm so scared to go to one - especially alone! I don't think I've ever hit one of those sales you speak of, don't think I want to!!! when I lived in Maryland the value villages were INSANE on 50% days. The line would be around the building to get in and then paying was a nightmare. It was impossible to get to the racks. I hated it. Then I moved to NH. The first time I went to Savers for their 50% off day I arrived early thinking it would be the same nightmare - and I was the ONLY one there. It got busier later - but nothing like my experiences down south. Much better - and they let club card members in a day early - which ROCKS!!! WOW - I wonder if it's different in other areas than it is around here, too? Probably! One of my local thrifts has a 50% day once a month and IT IS A ZOO. Luckily most people are there just for the clothes, so I can just squeeze past them to get to the good stuff. The check out lines are killer though. Thank God for cell phones and Pinterest. We have 50% sale days at Goodwills here in Central Indiana the first Saturday of every month. I used to religiously go to this sale. However, so many people hit up the thrifts for the same goodies, I never find anything on these days, so I just stopped going! Our Value Village used to have a .99 cent day and it was HELLISH. I went a couple of times, but as you say, there were fights, hiding, hoarding, stealing out of each others carts etc, etc. I think they still do 99 cent day, but I won't ever go again! oh wow. thrift stores never get that crazy down here in Australia. that's wild!